Are you looking to sharpen your understanding of BIM and Digital Engineering? Want to understand how Geospatial Professionals can add value to BIM? Want to get more than training alone? With us you get a COMPLETE SYSTEM to embed your learnings. • Who is this for? This course is for existing Geospatial and Geomatics Professionals, such as CAD modellers, GIS, mapping, survey professionals, who wants to learn more about BIM and Digital Engineering. • Course Format: Online live Webinar with tutor. Interactive with questions and reminder assessment questions throughout. Digital training material available online after course plus follow-on calls after session (for 4 weeks, 1 per week) to help embed what has been learnt. • Not Technology / CAD focused: This is not a ‘3D CAD Modelling’ course. This course teaches the principals, concepts and business drivers behind BIM and where the opportunities are for geomatics and geospatial professionals. There is reference to the UK's BIM standards – however principals are universal. •	Course Location: Online - interactive with live Tutor-led presentation with a Q&A (not recorded content), via GoToWebinar. Follow-up sessions also online. •	Exclusive Session: Places are limited to ensure best learning outcomes with a small group. a) 1 x Open Tutored Session: 3.5 hours initial online Tutorial with other students. Session of 4 hours in length with a 15 minute break in the middle and 15 minutes Q & A at the end as extra. b) 4 x Private sessions: plus up to 4 one-to-one online follow-up sessions of 1 hour each (= 4 hours). Times of these will be arranged to fit your schedule. c) eBook - You get a digitla copy of 'BIM for Geospatial Professionals' - the new ebook from Steven Eglinton. 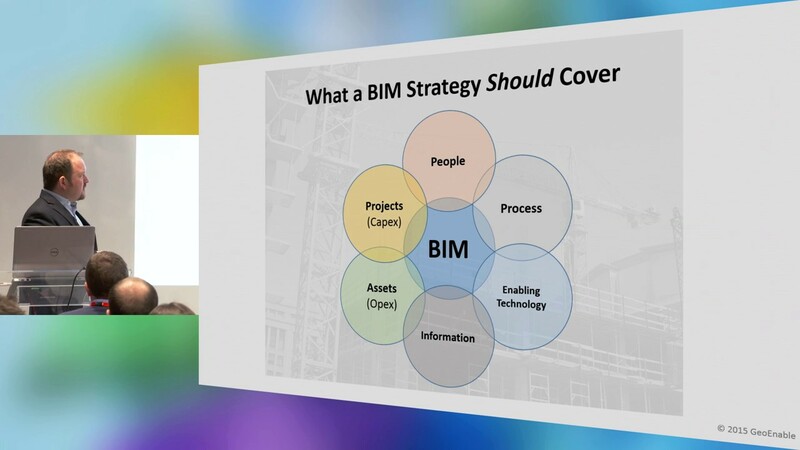 This will help embed your learnings and includes a 'BIM jargon buster'. • Payment method: If you need pay via PayPal using this booking form - contact us for more details. • Certificate: Upon completion of the Tutor session and any one-to-one follow-up session, you will receive a certification of completion, detailing the topics you have learnt. • Have Questions? For more information please call +1.650.265.2636 and ask to speak to Matthew Neil, our Global Training Coordinator. Metadata - how do we embed this? Steven Eglinton is a very experienced information management, geospatial and digital transformation specialist with almost 20 years' experience of strategic definition, Project Management & hands-on technical implementation, particularly within the Built Environment and Natural Environment sectors. He recently worked with the UK Central Government both the Department for Business, Energy and Industrial Strategy (BEIS) and the Cabinet Office on the delivery of BIM and robust Asset Information. He has also worked with Network Rail, Transport for London, Highways England, various Local Authorities, Utilities and Energy companies and property organisations companies to name a few. In the past few years he has also taught the main BIM courses in the UK - on behalf of both the Institution of Civil Engineers (ICE) and the British Standards Institution (BSI) - all with excellent delegate feedback. His background is in mapping, Geospatial solutions and GIS, but now consults on Information Management (IM) in the widest context. Most often Steven works with Architecture, Engineering, Construction, Owner Operator (AECOO) clients - such as property developers, Rail and Utilities companies. My professional background lies in information management and project management. I havealmost 20 years' experience of both hands-on implementation and strategic development of Information and Knowledge Management activities. As well as BIM, I focus my professional practice on Infrastructure Asset Information, Geospatial Information and classification systems. This course is an online seminar, with the option of follow-up calls for 4 weeks (1 per week) to help you accelerate embedding what you have learnt in your business. We encourage you to take these follow-up calls to gain greater value from your learning experience. You will also recieve an ebook, related to this course, to use as reference, with a 'BIM jargon buster'. At GeoEnable we are focused on democratising the power of better information management and integrated insight into everyday business decision-making. GeoEnable is a leading Information Management and Geospatial consultancy. Read more at www.geoenable.com. If your organisation has specific learning and development objectives, we can tailor this programme to suit your needs. To discuss the tailored training options available to you with one of our training account managers, please use contact us. Our Partnerships: We are official partners with Esri, Leica Geosystems and Mitra Innovation.